Release of VALIDATE® Procalcitonin, for Abbott ARCHITECT users, allows clinical laboratories to complete their required Procalcitonin linearity and calibration verification and maximize the reportable range while minimizing manual dilutions. LGC Maine Standards releases VALIDATE® Procalcitonin linearity and calibration verification kit, for Abbott ARCHITECT analyzers, Order Number 403ab. The kit, in a human-serum matrix, evaluates Procalcitonin (PCT). 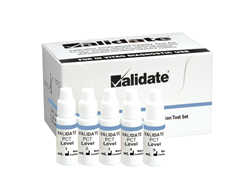 Each VALIDATE® Procalcitonin kit, liquid, ready-to-use, multi-use, and prepared using the CLSI EP06-A “equal delta” sample preparation, offers five distinct concentrations covering the reportable range. Simply dispense the solution from each dropper bottle, directly into five sample cups, and run in replicates. Release of VALIDATE® Procalcitonin, for Abbott ARCHITECT users, allows clinical laboratories to complete their required Procalcitonin linearity and calibration verification and maximize the reportable range while minimizing manual dilutions. Use of this product, while augmenting daily QC, assists with fulfilling various quality control requirements – such as Reportable Range and Analytical Measurement Range (AMR) – for linearity and calibration verification under CLIA ‘88, CAP, COLA, JCAHO, JCI and ISO 15189. The addition of VALIDATE® Procalcitonin, for Abbott ARCHITECT analyzers, to the LGC Maine Standards expanding portfolio of products demonstrates a continued commitment to manufacture high-quality linearity and calibration verification products that meet industry needs. LGC Maine Standards is located in Cumberland Foreside, Maine and manufactures VALIDATE® linearity and calibration verification kits for over 130 analytes, including General Chemistries, Urine Chemistries, Enzymes, Lipids, HbA1c, Therapeutic Drugs, Cardiac Markers, Thyroids, Serum Proteins, Vitamin D, Tumor Markers, Anemia, Fertility, Hemostasis and Whole Blood Glucose. LGC Maine Standards MSDRx® data reduction software is available at no charge for real-time data analysis or a laboratory can send their data to LGC Maine Standards where a technical specialist will complete the data analysis and return a report within five business days. Peer group comparison is also available upon request.